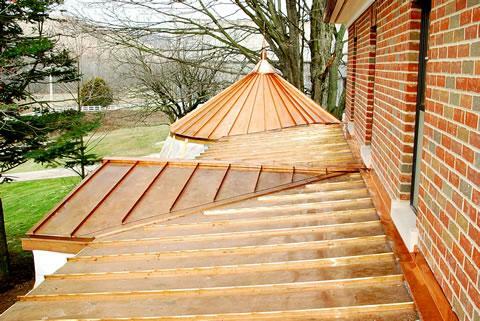 Commonwealth Construction uses true individual, solid (99.96%) copper shingles. Each Copper Shingle is individually installed and inspected guaranteeing the exact standards you expect from a copper roofing installer. Commonwealth Construction will install copper for an attractive and affordable price. For existing structures, Commonwealth Construction can provide a complete take-off of materials needed. Do you have questions about copper installation? Trained Commonwealth Construction personnel are available to help during normal business hours with any and all questions. With over 25 years of experience, Commonwealth Construction has the expertise to advise on almost any metal roofing project, from a small shed to large, complicated commercial applications. Call or email Commonwealth Construction for further questions and information.